This chocolate chip cookie recipe is definitely a keeper! A few months ago I came across an advertisement by McCormick for their pure vanilla. It came with a recipe for Vanilla Rich Chocolate Chip Cookies. As I looked at the recipe I noted that it called for 4 tsp. of vanilla, much more than usual for vanilla, and I promptly tore it right out of the magazine for future use. 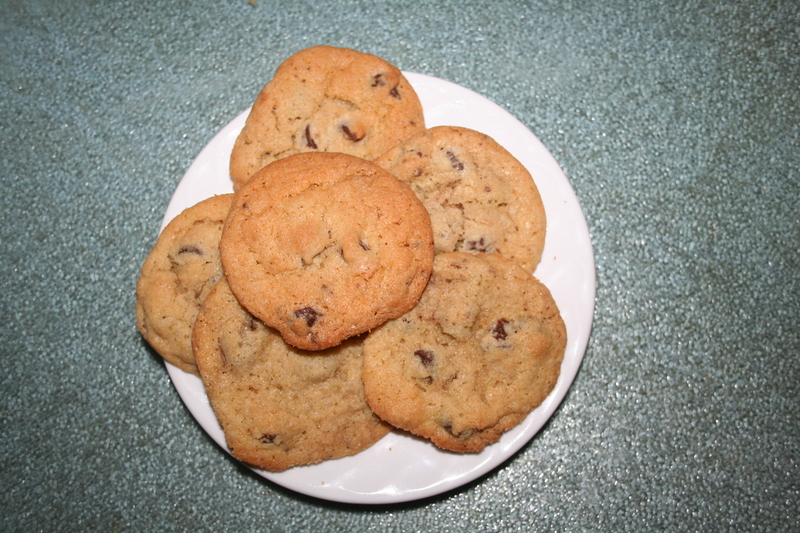 It’s funny, with all the recipes I have and all the cookbooks I have, I’ve never found a recipe for chocolate chip cookies that is “my” specific, always-go-to-recipe for Chocolate Chip Cookies. This recipe might just be it. I tried it out recently because I wanted to make cookies for a friend’s 40th birthday. She’s someone who is always “there” and never asks for anything in return. I decided that I’d make her a plate of 40 chocolate chip cookies and this is the recipe I used. Even though I made 40 for her, I still had another two dozen or so left for us. This recipe made a ton. The cookies are delicious. I like hard, crunchy chocolate chip cookies and of course I like vanilla, butter and brown sugar. This recipe had it all! I will say though, as much vanilla was in them, it wasn’t an overpowering taste and it didn’t seem like it had as much vanilla as I knew it did! Try them and see how you like them! Mix flour, baking soda and salt in medium bowl. Cool on baking sheets one minute. I was the happy recipient of the 40 cookies and I can tell you all they were delish! Between me, my husband and one of my boys they went fast. You should try them.